IN THE MATTER of William Rehnquist vs. Bill Clinton, Bob Dole, Newt Gingrich, et al., I'll take my stand with the politicians. Speaking at American University last week, the chief justice delivered a sermon on the subject of judicial independence. His remarks were meant as a rebuke to the president, the Senate majority leader, and the speaker of the House, all of whom had gone so far in criticizing a federal judge – the Hon. 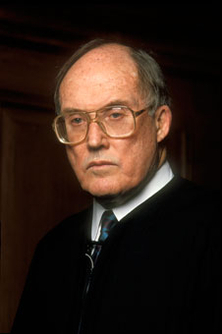 Harold Baer Jr. of New York – as to suggest that he be expelled from the bench. Since federal judges enjoy lifetime appointments, the only way to remove Baer would be to impeach him or to pressure him to resign. Dole proposed the former; Clinton and Gingrich (along with 150 House members), the latter. For shame, scolded Rehnquist. Such threats amount to an assault on "one of the crown jewels of our system of government," namely, the confidence of federal judges "that their judicial acts – their rulings from the bench – would not be a basis for removal from office by impeachment and conviction." In Rehnquist's view, the only justification for forcing a judge to step down is "criminal conduct such as tax evasion, perjury, and the like." In other words, if a judge lies or steals, he can be stripped of his robe. But if a judge is incompetent -- if he exercises unsound judgment or perverts justice or endangers the public with scandalous rulings – he should be immune from discipline. This is "one of the crown jewels of our system?" Recall what Judge Baer did to ignite this firestorm: He ruled that $4 million worth of cocaine and heroin seized from a woman's rented car in a high-crime section of New York was inadmissible as evidence against her, since the police had searched her car without reasonable suspicion. And why was their suspicion not reasonable? Because all they saw were four men stuffing duffel bags into the trunk of her car – and running away when they spotted the police. Nothing suspicious about that, said Baer. Boyz in the 'hood just don't like cops. "Had the men not run when the cops began to stare at them," he wrote, "it would have been unusual." That wasn't all. If the search was illegal, the woman's subsequent arrest was illegal, too. So Baer also threw out her videotaped confession that she was an experienced drug courier who regularly made the run between Detroit and Manhattan and was being paid $20,000 for this trip. Bottom line: Evidence suppressed, charges dropped, professional criminal given a pass. There followed an eruption of criticism, complete with the impeachment rumbles; in due course, Judge Baer saw the light (read: felt the heat) and reversed himself. But the question remains: Does this man belong on the federal bench? And if the consensus is that he – or any other judge – does not, how do we get rid of him? You don't, say Rehnquist and the judicial fraternity. Judges may be impeached only for "high crimes and misdemeanors." Absent that, the only remedy for an intolerable judge is to await his death or retirement. This, in Rehnquist's words, is the sacred "doctrine of judicial independence." Nowhere does the Constitution decree that judges shall be untouchable gods, exempt from the checks and balances that bridle the other branches of government. In the system the Framers devised, the people – not the judges – are sovereign. Just as the executive and legislative branches are controllable by the people, so is the judicial branch. And the tool for dislodging judges who have lost the public's confidence or abused its trust is impeachment. Not only for "high crimes and misdemeanors," either. That phrase comes from Article II of the Constitution, which deals with the presidency; it is the standard set forth for removing "the President, Vice President and all civil Officers of the United States." But Article III, which covers the judicial branch, expresses a far more flexible standard: "The Judges, both of the supreme and inferior Courts, shall hold their Offices during good Behavior." What is "good behavior?" That is for the House and Senate to decide. Were there political motives in the attack on Baer's ruling? Sure there were. The Republicans wanted to score points against Clinton, who appointed him; the president wanted to deflect their criticism by coopting it. Moreover, Baer is widely reported to be a conscientious man; I've no doubt he firmly believed in the rightness of his ruling. Nevertheless. If a Democratic president, the Republican leaders, of Congress, 150 members of the House, numerous local officials, and a great swath of the public all agree that a judge's ruling was an abomination, that's a fairly good indication that it may have been an abomination. A judge who issues abominable rulings, however sincerely, breaches his constitutional obligation of "good behavior" – and the people have the right to get rid of him. The impeachment tool has grown rusty with disuse. It ought to be resorted to more frequently. When judges make blunders that shock the conscience, calls for their removal aren't cheap shots. They are healthy and honest, and just what the Framers intended. A war memorial is in the form of a cross. Is that a problem?